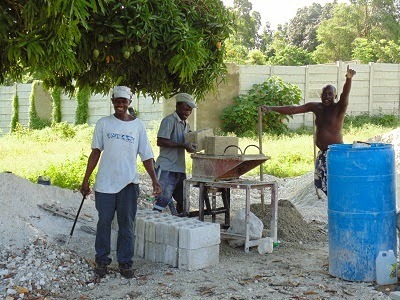 In our Children's Village property, under a mango tree, workers are making concrete blocks to be used in the construction of EachOne BuildOne homes. These are homes built for families that lost their homes in the earthquake. If they own their own land and can supply help with the labor, they may qualify for one of these homes. People from North America donate the funds for these homes. The cost of one is between $6,000 - $8,000 US. The block maker does two at a time. They are set out to set for a day to harden and then they are ready for use.